The following page came into being completely out of chance. 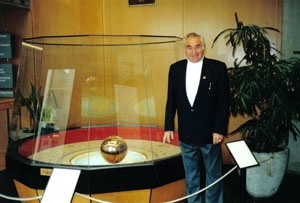 I had recently updated my Foucault pendulum page received a wonderful email from the daughter of Karl-F. Hafner commenting on my mentioning of her father's design at Carleton University. One thing led to another and I was given the opportunity to meet with him. Having searched so hard for the few items I had on the pendulum I proposed the idea of documenting it more fully and offering this page for that venue. Karl was so graciously kind enough to entertain me in that regard and take a giant leap of faith I would do it justice. This story really starts at the National Research Council (NRC) in April 1955 for it was there that Dr John Hart & Karl Franz Hafner initially met. During their tenure there they became a very productive and complimentary team achieving much success and rising through the ranks together. In 1957 Dr Hart left the NRC to join the faculty of the Physics Department at Carleton. At that time they were still at the First Avenue location. With some prodding by Dr Hart, Karl joined the faculty in 1958 becoming Chief Technical Officer. By 1961 John became the Chair of the Department. It was during this time (1959) that the move was made to the present campus (albeit the Tory Building) and in 1962 the new building for the physics department went into the planning stages. Being the Chief Technical Officer much of the responsibility of overseeing the technical plans went to Karl Hafner. 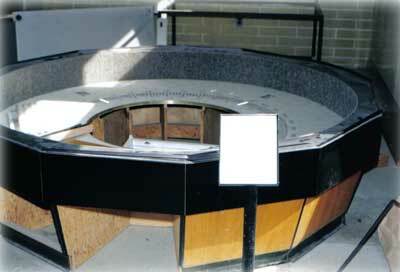 It was during this early planning stage that Dr Hart championed the idea that the lobby of the building should be a showcase for a great experiment in physics, that of Leon Foucault's pendulum however in 1963 Dr Hart left to become Director of Science Studies at Brock University in St. Catharines (later to Lakehead University as Dean of Science and finally to University of Victoria BC). While no longer present he had left his mark as it were and thus it came to be that the 5 story open area of the lobby was designed into the building. 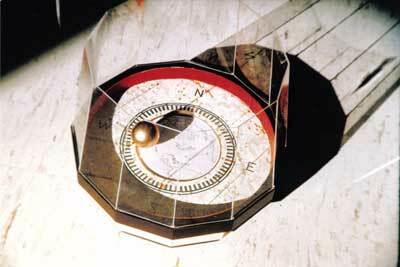 It would later come to pass that as part of the construction contract a pendulum was to be made for the building. To facilitate this early planning stage with it's inherent complexities Mr. Hafner made a large scale model of the entire building accurate to 1mm. This later proved fortuitous when permits were being obtained. The city planning committee required a true colour presentation be done of the proposed site & building and it turned out the university had not done one. Mr. Hafner was able to save the day and generate one by photographing the site and the incredibly detailed model for a slide show presentation to the committee. Approval was given and in 1964 construction started on the new building. Given some of the complex and unique design requirements for some planned laboratories, it was not until 1966 when construction was finally completed. Alas the architect firm while proficient in the construction aspects of the project was unable to find any able yet available consultants for the construction of the pendulum even after including the UN in their search. When it was done the building completely reflected all the planning save one aspect. 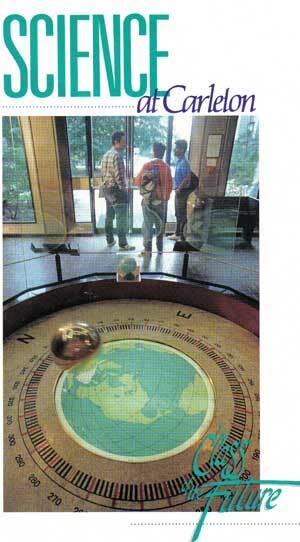 The planned Foucault Pendulum in the lobby of the building had not materialized. On a returning visit in 1969 Dr Hart noticed the empty space and prodded Mr. Hafner that something should be done to realize the original desire. Karl eventually took it upon himself to see the original goal through and in 1970 he began the undertaking. To cast the bob it was decided that Bond Brass in Eastview Ontario (now Vanier) should do the job as they had just completed a similar sphere for a joint Chalk River Nuclear Laboratories / NRC experiment (purpose unknown). In order to get it cast at a reasonable cost Bond Brass was supplied with a sufficient supply of scrap brass & schwarf from the university machine shop. 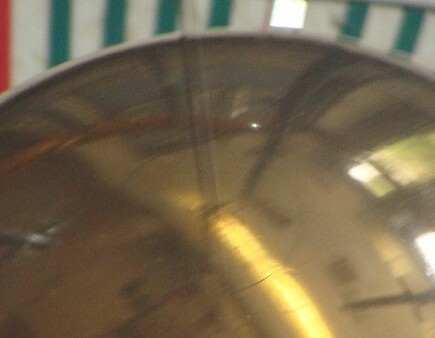 Given the variable nature of brass as an alloy the 12 inch hollow sphere and both end caps were cast at the same time so that all three matched in colour/shade. With the open ended design the unit could be held in a lathe and by use of a custom made radius cutting attachment the exterior of the bob was transformed from the rough cast unit from Bond into the polished sphere it is today. The end caps have 1.5 inch pipe threads on them making the seam invisible. The top cap has an Ø0.080 inch hole bored into it for the Ø0.078 inch wire to pass through. On the inside of this cap is a tube that goes right through to the bottom cap so the wire is protected. This tube is silver soldered to the top cap making it a permanent assembly. The bottom cap has dual holes in it for tool removal in case disassembly is ever required. It also has a bored recess to accept a slug with three 10-32 set screws for securing the bottom end of the suspension wire. The wire comes through the top cap and tube, through a similar hole in the bottom cap and slug where the set screws hold it fast. In use the slug hides within the bored recess of the bottom cap more or less invisible. The 12 inch 231 lb lead filled brass bob. The top and bottom caps can just barely be discerned (see CAD drawing). The pedestal and dial were, as Karl described it, somewhat similar to boat construction. There are plywood ribs every 30° with wood bracing in between which form a dodecagon (12 sided polygon). 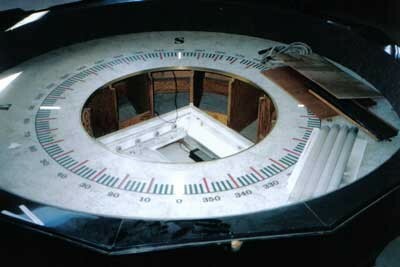 The plywood formers support the circular dial made from plywood and covered in Arborite and, at a lower level, the central circular backlit map (described below). Under the map was an open area where 2ft x 2ft fluorescent lights were placed on the floor to shine upwards for back-lighting the map. 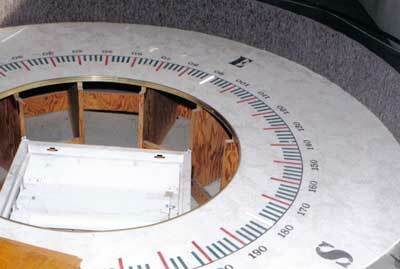 Around the dial is a raised black platform circular on the inside for the dial but forming a dodecagon on the outside. Along this outer edge sit the 12 large glass panels which form the windscreen. The light oak exterior panels were made from the same material and painstakingly matched in colour to the paneling in the building so that the two would look like an integrated whole (part of the original vision for the building). 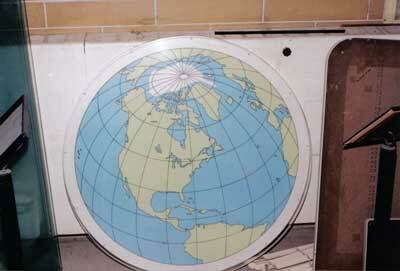 In order to create the map that was to be centered on Ottawa Mr. Hafner made use of a 12 inch globe he had in his office. 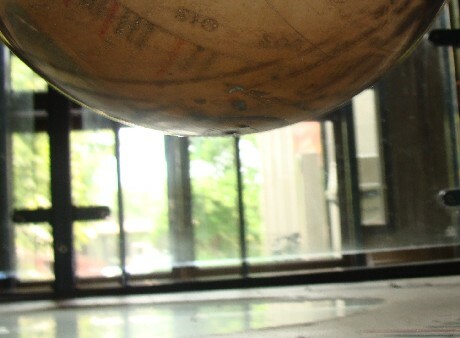 Using a tripod mounted camera repeated exposures were made with slight variations to the globe's orientation. After selecting the negative exposure deemed best it was projected onto a flat surface and the land mass and meridian outlines were painstakingly traced. With a set-up such as this such large magnifications make this a difficult task due both to the resolution and the limited contrast/brightness. When the outlining was completed an initial version was done in water colours. A later version was done with coloured adhesive films instead of the water colours. All of this Mylar artwork is under a 1/2 inch thick 36 inch diameter acrylic sheet held in the center of the dial with J-clamps used for attaching aluminum chalk board trays. 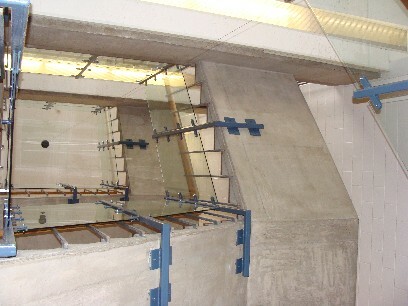 To initially place the pendulum at its exact planned location upon the floor of the lobby that position had to be determined on the featureless roof of the physics building 55ft up. Being involved in the planning of the new physics building Mr. Hafner had access to the blueprints of the building and knew of specific pre-stressed concrete panels which were available at both the ground floor and on the roof. Using these as references he took X-Y dimensions to the preferred position in the lobby which he then repeated on the roof. After scraping away the gravel and tar an initial 3/8 inch bore hole was drilled in the roof and a test plumb-bob was hung to check the resultant location on the lobby floor. A minor correction was decided upon and the main 3 inch hole was bored. The initial hole was enlarged and another was placed opposite the main hole leading to the present small-large-small three hole arrangement. It is from this central 3 inch hole that the main suspension wire passes through. Two feet down it passes through the suspended ceiling with a can acting as a clearance bushing. The remaining two side holes allow a pair of wires attached to the can in the ceiling panel two feet below the concrete roof to be manipulated for panel removal or replacement. For a short study period in the fall of 1970 after initial construction the pendulum had no drive circuit and was kept in motion by Mr. Hafner imparting a push with a 2m stick while leaning over the stair railing several floors up several times a day. Apparently no one was aware of this initial power source given its reliable nature. After this initial study period the construction of a drive circuit was initiated. The drive circuit actually consisted of two parts. The power supply and the switching/timing circuit. The power supply to drive the coil converted 120VAC to 12VDC @ 2A and consisted of a Hammond transformer, a full wave rectifier etc. Several methods of timing and triggering were experimented with. An early triggering design that was different from that shown was tried. It consisted of a conductive conical piece attached to the wire just above the armature. [See the photo above] It would, at the extreme end of it's swing, touch a gold plated annular ring similar in diameter to the coil and placed just above it. This would activate the governor. The governor consisted of a lamp, a photo diode (large diameter rod in the photo) and a microcircuit decade counter. When the inverted cone on the suspension wire contacted the gold ring above the drive coil the drive was de-activated. The lamp, photodiode and decade counter would then track and count the next ten 1/2 swings before reactivating the circuit and allowing more pulses. This design was ultimately abandoned since two problems were observed. The solutions to both were made simultaneously. The first issue was that between the contact and the strong drive pulses traveling waves could be observed traversing the suspension wire. A rubber O-ring was added to the armature to act as a cushion when touching at the extreme end of swing and because it acted as a Charron Ring. 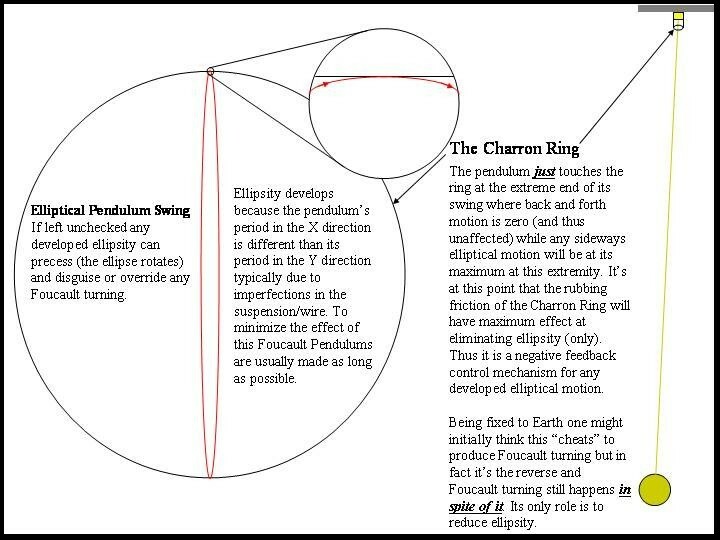 A Charron Ring frictionally damps out any sideways motion at the extreme end of swing where the sideways component of motion is greatest (and the back and forth motion is zero) thus minimizing the tendency of a Foucault Pendulum to develop an elliptical swing. The second part of the solution was to lower the output of the power supply (adjusted using a variac on the input) and migrating to a non-contact magnet and magnetic proximity switch design. 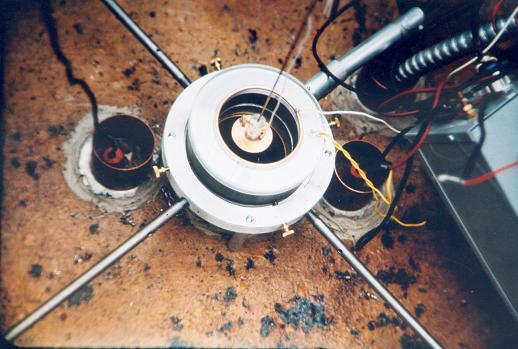 The vacuum-sealed glass-encapsulated proximity switch sat at the edge of the drive coil while a magnet held by an arm off the suspension wire was held above it. During the swing the magnet would approach the switch and when centered the switch would close initiating a 1.25 sec pulse from the drive circuit. This circuit worked well for a fairly long period but it too was ultimately abandoned as the proximity switch was not up to the incessant demand of an horological type application. After a period of time switching the inductive load the silver plated contacts began pitting thus giving sub-standard performance. The final solution was to migrate to a spot-welder type circuit. In this case a silver wire/rod stands up at the coil edge. There is also an arm holding a silver contact on a reed spring protruding off the suspension wire. In a similar fashion to the previous circuit at center swing contact is made between the two and the 1.25 second coil pulse is initiated. Ever since the drive circuit has been reliably pulsing the pendulum 7.8 million times a year for close to 40 years. Karl also made a small representative model of the pendulum made for "Open House" and demonstrations. With the ball suspended from above the small model would be placed on a rotary platform, typically a stool. 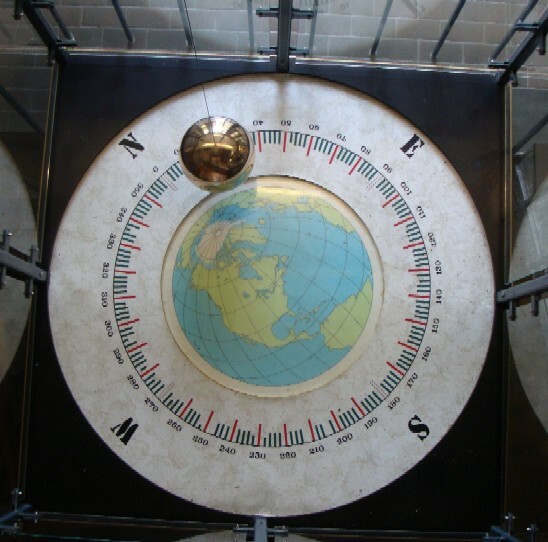 It would allow visitors, mothers of students etc to quickly grasp what it was that the much larger, slower "moving pendulum" was demonstrating. Recently the lobby of the Herzberg Physics building has undergone extensive alterations to install an elevator. Unfortunately part of the lobby was utilized in this transformation and as a result the pendulum has been relocated to within the stairwell. Because of the very confined nature of the new placement several things have been done which detract from the original design. 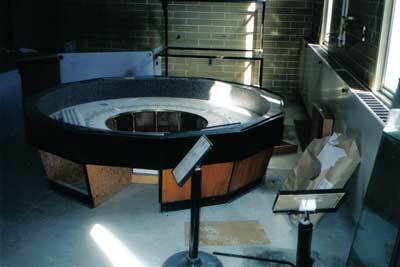 First the pedestal has been cannibalized for the map (no longer backlit) and azimuths. These have been placed on the floor at the inner base of the stairwell and now the face is square. Secondly large glass shields have been put in place all around the base of the pendulum. Due to the tight nature of the stairwell these glass shields have additionally been placed all along the inner edge of the stairwell. 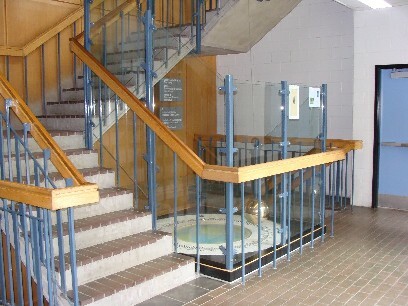 These glass shields, while a reasonable precaution around the base, prevent high vantage point viewing of the pendulum due to their presence along the stairwell. 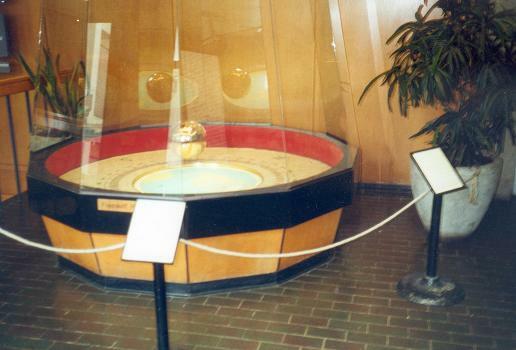 Present view of the pendulum in the lobby (left). The view up toward the suspension point (right). Glass shields encapsulate the stairwell. Karl retired in 1992. He now lives south of Ottawa on the Rideau River in a Chalet style house he designed himself. 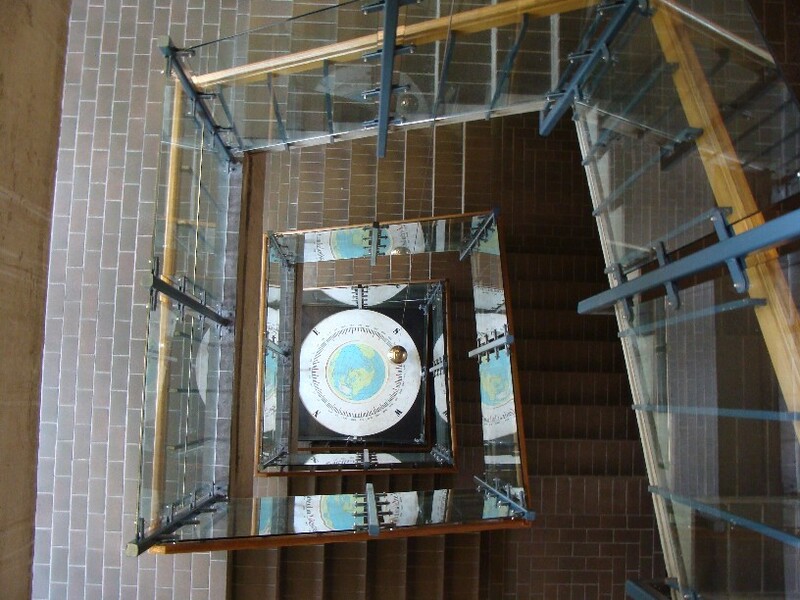 The pendulum, while recently relocated to within the stairwell, continues to majestically swing and I suspect it will continue to do so for at least another 40 years.